When it comes to progressive environmental policies, most people look to the EU. And so far the EU’s tough stance when it comes to promoting the green economy and reducing carbon emissions is paying off. Between 2011 and 2012, the EU’s carbon emissions fell by 2.5%. This reduction situates the EU at 17.5% below 1990 levels, which is the base year for the Kyoto Protocol. The EU-15 (the original 15 EU countries) stands at 14.1% below 1990 levels. So what are the main causes for this reduction? Most analysts suggest that a milder winter, reduction of natural gas usage, and increases in renewable energy all contributed to a decrease in carbon emissions. So although some might be tempted to suggest a slowing global economy is the source of the carbon reduction, there were clearly other forces at work (in fact both GDP and coal consumption increased in 2011). Sectors of the EU that contributed most to decreased carbon emissions were households and service industries. The transport industry managed to reduce its carbon footprint for the fourth year in a row. Finally, the emissions trading scheme encouraged another 1.8% reduction from companies within the EU’s carbon market. When it comes to reducing emissions, the EU seems to be leading the way. At this rate, the continent could end up surpassing its goal of a 20% reduction by 2020. Meanwhile China is surging ahead in the green economy, and may become a major player in the global clean economy in another few decades. What are your thoughts on the EU’s carbon reductions? To what extent do you think environmental policies played a role in these reductions? 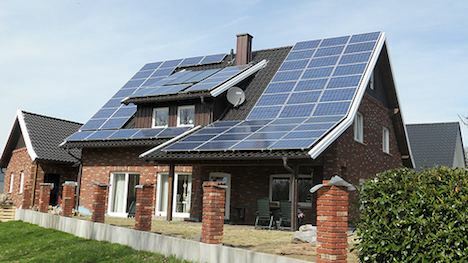 Image CC licensed by Tim Fuller: Solar panels covering a house in Germany. Next post: Top 10 Dirtiest Cites In The United States: Let The Clean Up Begin!